What is a work of art? Is ‘high’ art superior? Can science help? Do the arts make us better? Can art be a religion? These are among some of the simple questions that John Carey asks in his book, What Good are the Arts?, in his attempt to make sense of art, culture and cultural theory in the 21st century. The answers Carey has to offer are often provocative, far from easy or pat, and they certainly do challenge the perceived wisdom surrounding ‘aesthetics’ of the past two and a half centuries. The term was coined by Alexander Baumgarten and amplified by Kant when he first wrote about beauty and our response to it in his Critique of Judgement. Although Carey does believe that some lines from literary works, ‘are ideas strong enough to live by’, like perhaps Arnold’s famous ‘touchstones’, all arguments about art are relative, and while there are no false answers in art, there are no true ones either. This echoes what the critic David Daiches said half a century earlier about literary art in one of his many books on criticism, which for Seamus Heaney as an undergraduate was ‘a class of a bible.’ Daiches wrote, ‘there is no single ‘right’ method of handling literary problems, no single approach to works of art that will yield all the significant truths about them … While the scrutinizing of literary theories is a valuable philosophical activity that can not only throw light on the nature of literature but also help us to read individual works with greater understanding and appreciation, the active appreciation of literature is not always dependent on such theorizing … Art is greater than its interpreters … All criticism is tentative, partial, oblique … Art is meant to be experienced, and in the last analysis the function of criticism is to assist that experience … To enjoy with discrimination, to discern value, to recognize and reject the spurious, to respond maturely to the genuine, never to be fooled by the shabby and the second-hand – that is the civilised approach to the arts. We turn to criticism to develop and strengthen that approach, … criticism can come to this task directly or indirectly, through a frontal attack on individual literary works, through theoretical discussion of the nature of literary value, through investigation of origin and growth and causation. Every effective literary critic sees some facet of literary art and develops our awareness with respect to it; but the total vision, or something approximating it, comes only to those who learn how to blend the insights yielded by many critical approaches’. Carey adds that since art ‘must accommodate all personal tastes and choices … it is as illimitable as humanity, and as extensive as the imagination.’ In answer to one of his questions at the opening of the book, ‘do the arts make us better?’, Carey writes, ‘literature does not make you a better person, though it may help you to criticize what you are. But it enlarges your mind and it gives you thoughts, words, and rhythms that will last you for life.’ This much any reader should be happy to settle for. 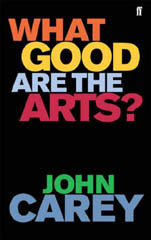 Tags: John Carey, What Good are the Arts?